As an organiser of UX Camp Brighton, it can be tricky to squeeze in time for a talk on what's usually a pretty hectic day. Preparation in the run-up to the event also makes it challenging to find time to put together a talk, so this year I decided to run a discussion rather than sweat over a slide deck. I'd chosen to talk about Google Ventures Design Sprints. Having recently run a few Sprints both client-side and internally, I thought I'd share my early findings. GV's Design Sprints are still a relatively new format for most, so discussing potential pros and pitfalls could help those new to the process. Used appropriately, Sprints are a valuable process bringing some surprising additional benefits to the table. My pitch card from the UX Camp Brighton session grid. I used the UX Camp Brighton Slack channel to sound out my discussion idea. Adrian Howard suggested I use the Lean Coffee format to give the session structure; a technique I'd heard of but never tried. Using Lean Coffee would also be an opportunity for to experiment with a new facilitation method. Set up three columns with the headings 'To Discuss', 'Discussing', and 'Discussed'. (on a whiteboard or table, depending on space). Share post-its and pens amongst attendees. Each person spends a few minutes writing down potential topics for conversation around the chosen theme. Collect together post-its into the 'To Discuss' column and briefly pitch each topic. Voting time! Each attendee is given two dot stickers to choose the topics they wish to discuss. Topics are re-ordered based on number of votes. We're now ready for the discussion to begin. The diplomatic nature of Lean Coffee continues from preparation into the discussion itself. Once the most up-voted topic is opened to the floor, a timer is set (usually 3-5 minutes). Discussion continues until the timer elapses, at which point a simple thumbs up/down vote is taken to decide whether to continue discussing the topic (thumbs up), or move onto the next most popular subject (thumbs down). Time can pass quickly during a Lean Coffee discussion. Sessions vary in length, but 60-90 minutes is quite standard. The 20 minutes available at UX Camp Brighton meant we only had time for a few topics of conversation. The most popular topic for our discussion at UX Camp Brighton was simply, "What are Design Sprints"? I'll be writing more about my own experiences running Sprints in a future post, including some of the insights shared by other attendees at UX Camp Brighton. 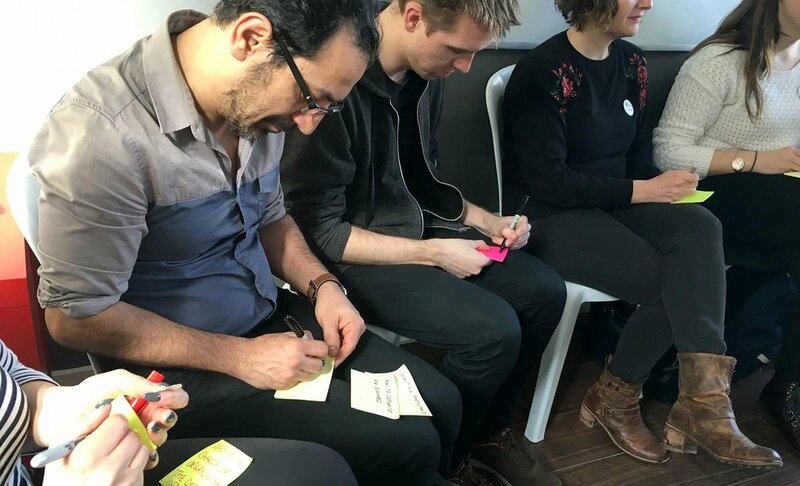 In short, although Design Sprints had appeared on the radar of most attendees over the last 12 months, few in attendance had found an opportunity to dig deeper or undertake a Sprint in anger. If you're also new to them, here's a playlist breaking down each day's activities on the Google Ventures Youtube channel. We touched on a far more important question in the later half of the session; "When is it appropriate to run a Sprint?". Used effectively, Sprints have many positives to offer, including a few non-advertised benefits (Cennydd Bowles has written an excellent rundown if you want to get up to speed). The verdict on Lean Coffee? It gets the thumbs-up as a simple method for discussion facilitation, and is one i'll be employing again soon.